Merriam-Webster defines an “objective” as something toward which effort is directed. The objective for most businesses is to make money. The objective for schools is to teach. The objective for our government is to improve our country. 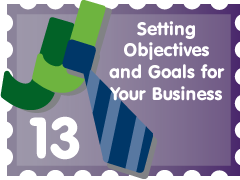 Objectives are general purposes that organizations strive towards. In business, one of your objectives should be to make money. If you are a new business, then maybe your objective should be to get organized and raise awareness for your product or service. Either way, objectives are important so you know what direction you are going. They need to be written so you can refer back to them. Goals need to be precise so you know exactly what it takes to achieve them. They should be time-attached so you give yourself deadlines. Goals also need to be achievable so you take them seriously. Finally, display and share your goals so you make yourself accountable for the outcomes of your business. In addition, goals are important because they give you a specific timeframe and destination for your business. During Summer 2009 (May 17th-August 15th), JuniorBiz has many goals and objectives. Listed are 6 objectives and 20 corresponding goals that should be completed by the end of summer, August 15th, 2009. OBJECTIVE 1:To write, publish and promote the Official JuniorBiz 75 Young Business Ideas and the Official JuniorBiz Lawn Mowing Guide. Goal 1 – To sell 50 OJLMG’s, e-book and/or paperback, by August 15th (currently, 3). Goal 2 – To finish the OJ75YBI and post for sale by August 15th (currently, 0% done). OBJECTIVE 2:To increase traffic to JuniorBiz.com by utilizing SEO tactics. Goal 3 – To have Alexa.com and Compete.com rankings in the top 300,000 most popular/trafficked websites. (currently, Alexa ranking of 565,000 Million and 832,175 on Compete). Goal 4 – To have 500+ visitors in one week (current record, 186). Goal 5 – To have a Google Page Rank of 3 out of 10 (currently, 0). Goal 6 – To have a Website Grader rating of 95 out of 100 (currently, 87). OBJECTIVE 3: To boost the online social media presence of JuniorBiz.com. Goal 7 – To have at least 3000 followers on Twitter.com (currently, 1272). Goal 8 – To have at least 100 fans on Facebook.com (currently, 24). Goal 9 – To have at least 100 subscribers to the RSS Feed (currently, 23). OBJECTIVE 4:To add interesting and relevant content to JuniorBiz.com. Goal 10 – To publish weekly journal updates in the ‘JuniorBiz Journey’ section. Goal 11 – To write and publish 13 new articles. Goal 12 – To have at least one article with over 25 Diggs and/or 50 ReTweets. Goal 13 – To have a Technorati authority of 10 (currently, 2). OBJECTIVE 5:To learn from local entrepreneurs and expand local awareness of JuniorBiz as an emerging entrepreneurial venture in Fort Collins, Colorado. Goal 14 – To have a press release published in 5 local (within Colorado) forms of press media (currently, 1). Goal 15 – To meet and develop a professional relationship (more than 1 email exchange or conversation) with 30 new business professionals. OBJECTIVE 6:To widen my knowledge-base in the areas of entrepreneurship and Internet marketing. Goal 17 – To read Baby Boy-R by May 24th and send a book and note to Ray Martinez (author) by May 30th. Goal 18 – To read Think and Grow Rich by June 7th. Goal 19 – To read Web Marketing All-in-One for Dummies (1 book/week) by August 2nd. Goal 20 – To find, read and comment on at least 1 new article related to entrepreneurship or Internet marketing per week (for a total of 13). Now I am accountable to everyone who reads this..